The screenshot feature of Android makes our lives much easier and more convenient. For example, you can capture the interface of a conversation and share it with your friends instead of retelling your words; you can capture the screen with some important or frequently-used information like phone number, password, email, etc. so that you can simply find them when you forget them. Hence, it is essential for you to learn how to take screenshots on Android and here are some tips for you. Here is a general way to take screenshots on Android - making use of MobiKin Assistant for Android. With the help of this tool, you are able to capture the screen of different Android phones, including Samsung, LG, Huawei, Xiaomi, HTC, Sony, Motorola and so on. Then you can save the captured pictures to computer directly. If you are interested in it, you can tap on the icon blow to download and install the program on your computer and then have a try. The "Screenshot" feature is only available on Windows version presently. 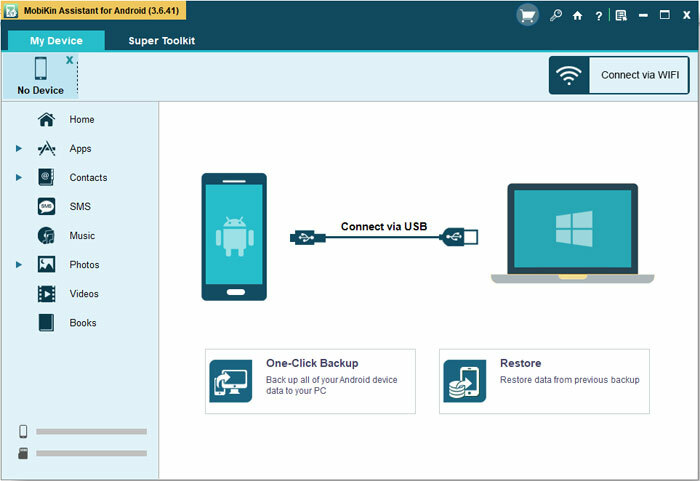 Choose to connect your Android phone to computer via USB cable or Wi-Fi. If you elect the USB connection, you need to use a USB cable to link your phone to computer and then turn on USB debugging on your device if required. For those who choose the Wi-Fi connection, they need to download and install the MobiKin Assistant for Android APK on their Android phones and then go with the tutorial to build a Wi-Fi connection. Now you can open the Android interface that you want to capture. Then you should turn to the program and simply tap on the "Camera" icon on the main interface. After that, two options will pop up: "Save screenshot to computer" and "Copy screenshot to clipboard". Here you can choose the first option - "Save screenshot to computer" and click on it. 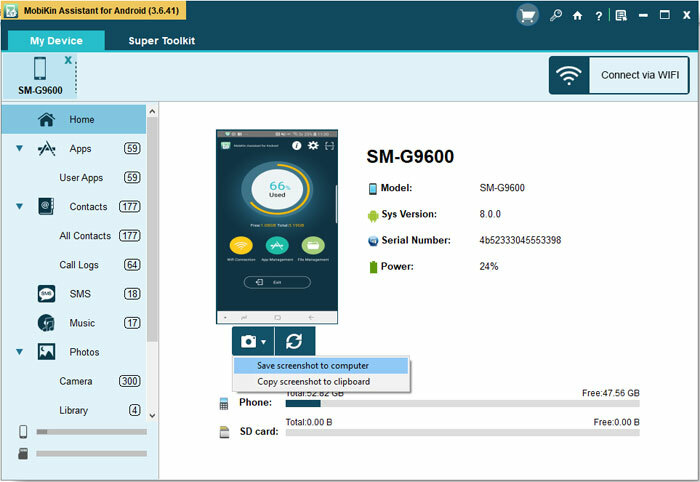 Then the program will capture the interface of your Android phone and save it to computer. Supposed that your Android phone is running on Android 4.0 Ice Cream Sandwich or later version, you can easily take screenshots on Android by pressing the buttons. This means is applicable to lots of Android models, such as Samsung, Google, Huawei, Xiaomi, etc. Now let's take a look together! First of all, go to the screen that you want to capture. Hold down the "Power" and "Volume Down" buttons at the same time. Then you can release the buttons when you hear an audible click which means the screenshot is taken. Here, if you do not press the keys properly, your mobile phone might turn off the screen or lower the volume. The first thing you should do is to access the options menu. To complete that, you can press the "Power" button of your Sony device until an options menu pops up. In the pop-up window, you will see several options. Just choose "Take screenshot" or "Record screen" to capture or record the interface that you want to save or share. Some Android devices also allow users to take a screenshot by using motions and gestures. Nonetheless, the motions and gestures to capture screen on different Android phones are disparate and it is hard to display them one by one. Hence, we would only show you the steps to take screenshot on Samsung by motions and gestures here. For other devices, you need to search the methods on Google. Go to "Settings" on your Samsung phone and then select the option "motions and gestures". After that, you need to toggle on the button to enable the feature "palm swipe to capture". Open the page that you want to capture and then swipe the side of your palm from left to right or from right to left. After that, the screen will be captured and saved to your "Photos" application. It is also available to take screenshots on Android by using application. Here, we would like to recommend you two high-rated Apps - Screen Master and Screenshot Touch. Screen Master is a free but powerful screenshot & photo markup tool. With it, you can easily capture the screen by touching the floating button or shaking device. The capturing process is easy to complete and no rooting required. Except for that, you can also use it to crop, text, pixelated image, draw arrow, rect, circle and more, which can make the screenshot edition more easily. Another tool you can trust is Screenshot Touch. It enables you to capture the screen by touching notification area and overlay icon or shaking the device. 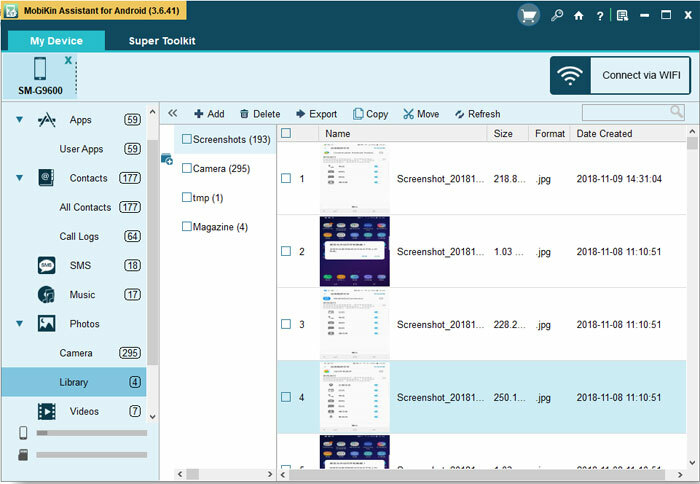 And also, it equips some other features, including image cropper, scroll capture, whole web page capture, screen recording and so on. But please notice that it only supports Android 5.0 or higher version. First, download and install the software on your computer and then launch it. Then you need to connect your Android phone to computer via USB cable or Wi-Fi and go with the onscreen prompts to make the connected device be recognized. After the recognition, the files on your mobile phone will be displayed on the program. Just tap on "Photos" > "Phone Gallery" in the left panel. Then all the pictures on your phone will be listed in the right column. Just find out the screenshots that you want to transfer and mark them. At last, you need to tap on the "Export" button at the top menu to start the transfer. When the process ends, the screenshots will be safely saved on the computer. [Solved] How to Backup Call Logs on Android Phone?